Ask anyone who has spent time living abroad about how the experience changed them, and you’ll get an array of answers – expanded cultural awareness, a greater sense of perspective on the world, improved language skills, or higher levels of confidence and self-esteem. It should come as little surprise that researchers have discovered that living abroad for any significant duration of time also makes people smarter. A 50-year study undertaken by the Institute for the International Education of Students garnered responses from 3,400 exchange students on how living and studying abroad had improved their lives. They discovered that 82% of the students and alumni developed a more sophisticated way of looking at the world as a result of living abroad. A similar study was conducted by William Maddux – an associate professor of organisational behaviour at a global graduate business school. He found that there was a correlation between students enrolled in an international MBA program, which provided multicultural engagement, and how “integratively complex” the students’ thinking became. According to professor Maddux, students with an adaptive and open attitude toward other cultures became more able to integrate multiple perspectives into their thinking and make connections among contrasting ideas. Confirming what Immanuel Kant said about travel in his Lectures on Pedagogy (1803), Maddux’s study showed that living abroad and engaging with foreign cultures improved students’ critical thinking and their ability to make connections between disparate ideas. As we discussed in our last infographic on the benefits of culture shock, when we’re physically removed from our comfort zone we find that new possibilities and outcomes seem to appear miraculously. This is because our brain enters a state of ‘relaxed attention’, enabling it to make cognitive leaps it would otherwise struggle with. But awakening latent creative talent is just one part of the story. 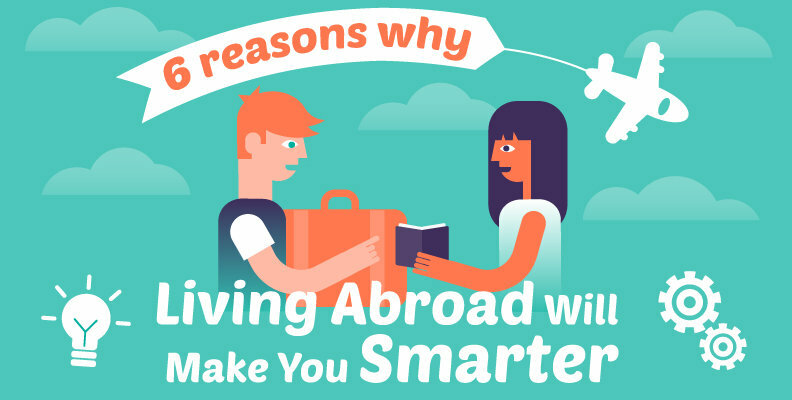 In our new infographic, we feature five other cognitive benefits of living abroad that improve brainpower. To find out more, read the infographic below.